To those who did, thanks for hounding me to get it done. This was a helluva lot of work, probably the hardest book to do since the ’97 version. I need a break but it’s on to Volume 3: The Ninieties. So… The Collector’s Guide To Heavy Metal: Volume 2  The Eighties, comprising 2,528 reviews and spanning 428 pages, is ready for shipping. Only albums officially issues in the years 1980 to 1989 were eligible for review. 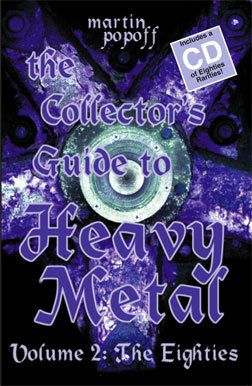 Wholesale rewriting and re-evaluation of reviews that were in the 1997 sourcebook, The Collector’s Guide To Heavy Metal, were undertaken, with approximately half the reviews being all new, many to complete catalogues, many more, reviews of ultra-rarities. The book is the follow-up to Volume 1  The Seventies, which was 1162 reviews over 344 pages. That book is sorta still available  I’m the only one with any, and I have about 20 left. This was a monster of a project. I cringe to think of the typos you will find, because no one actually had the time to edit/read/proof it other than myself, who of course, eventually hit a wall. There are a bunch of album cover shots, but less than the ‘70s book, due to the economics of the page count. To give you an idea of what’s in the thing, the letters C and G consists of 202 reviews, mostly full catalogues, covering Cacophony, Cacumen, Robert Calvert, Candlemass, Candy Roxx, Canedy, Feinstein, Bordonardo & Caudle, Cannon, Carcass, Carnage, Carrie, Carrion, Castle Blak, Celtic Frost, Centurion, Cerebus, Chainsaw, Chariot, Chasar, Chastain, David T. Chastain, Cheap Trick, Cheater, Cheetah, Chequered Past, China Sky, Chinatown, China White, Chrome Molly, Chyld, Cinderella, Cintron, Circus Of Power, Cirith Ungol, Cities, CJSS, Clientelle, Cloven Hoof, Cobra (2), Commander, Coney Hatch, Convict, The Sterling Cooke Force, Alice Cooper, Coroner, Corrosion Of Conformity, Coven, Randy Coven, Jess Cox, Craaft, Crack Jaw, The Creek, Crimson Glory, Crisis Party, Peter Criss, The Cross, Crossfire, Crucifixion, Crumbsuckers, Crying Steel, Crypt, Crysis, Crystal Knight, Culprit, The Cult, Curious George, Cutty Sark, Cyanide, Cyclone and for G, Gamma Gammacide, Gargoyle, Gaskin, GBH, Geddes Axe, Genocide, G-Force, Ghandi, Giant, Gilgamesh, Ian Gillan & Roger Glover, Gillan, The Pauline Gillan Band, Girl, Girlschool, Giuffria, Glacier, Glory Bell’s Band, Roger Glover, Goddo, Godflesh, The Godz, Gogmagog, Gotham City, Gothic Slam, Grave Digger, Gravestone, Great White, Green River, Greenway, Gregory’s Funhouse, Griffin, Grim Reaper, Grinder, Guillotine, Gunfire and Guns N’ Roses. This book is completely sold out! Personal check in US or Canadian funds also accepted: Martin Popoff, P.O. Box 65208, 358 Danforth Ave., Toronto, Ontario, Canada M4K 2Z2. If you are in the US and want to use a money order, make sure it's an international one.